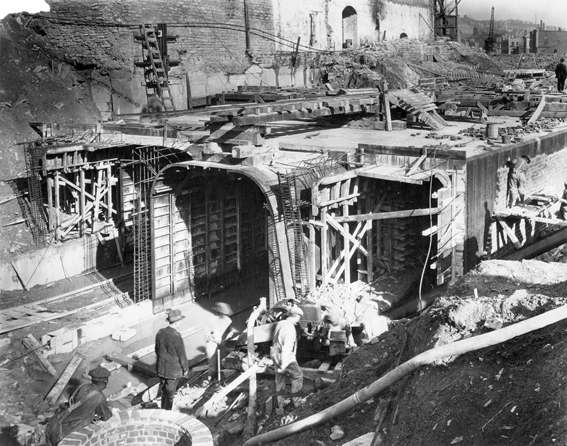 The construction of the subway seems to have been something of a spectator sport in Cincinnati, with groups of onlookers crowding along the banks of the old canal and hovering over the rails of bridges, watching as workmen dug out the canal bed to build the framework for tracks and tunnels. Digitally preserving eighty-year-old negatives and prints for online access requires clear guidelines and close attention to detail to ensure all information contained in the photographic records is captured. Such a project also requires careful organization of the physical collection so that all assets may be accounted for through each stage of the project. Finally, close inspection of the digital rendering is necessary to ensure the highest quality of scanned images is obtained and preserved for future use. 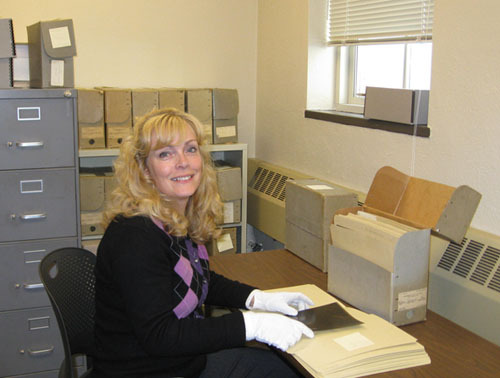 Digitization of the Cincinnati subway and street improvement project prints and negatives began this week with three boxes containing 681 silver nitrate-based negatives delivered to Robin Imaging Services for scanning. 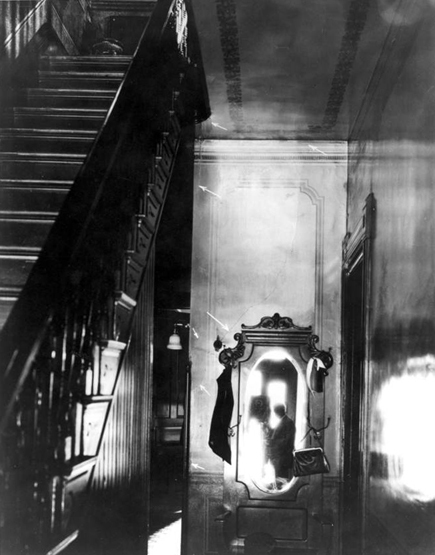 Each negative will be carefully scanned by a photo technician experienced in handling silver nitrate negatives, using scanners that operate at low temperature levels to ensure the sensitive nitrate is not exposed to heat. Each negative will be analyzed during scanning to ensure the proper exposure settings are applied to capture the best detail possible when it is saved as a positive image. The project is off to a great start after the first week, with progress made on identifying the percentage of nitrate negatives in the collection, meeting with Robin Imaging Services – the contracted vendor that will be digitizing the negatives and prints – and deciding on what metadata will be captured during scanning to build the online collections. Today’s image from the project is certainly an intriguing one: when the Rapid Transit Commission in Cincinnati went ahead with their intent to turn the Miami-Erie Canal route into a subway system, they hired a photographer to document every step of the project. His images detailing the particular day, time, and street location of the subway construction in the 1920s form the bulk of our digitization endeavor. 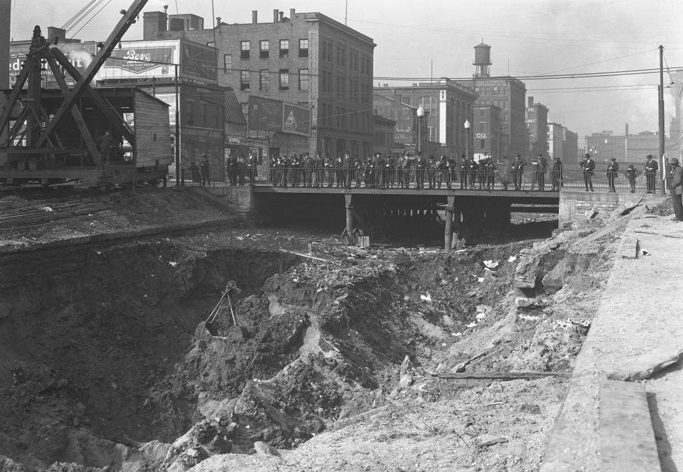 He captured extraordinary exterior views of the canal bed being widened and deepened as tunnels were built, showing the streets and buildings along the route that is now Central Parkway in Cincinnati. However, the construction also led to these buildings being damaged – cracks in ceilings, walls, and foundations in private homes and businesses, for which the owners were submitting claims for repairs and restitution.